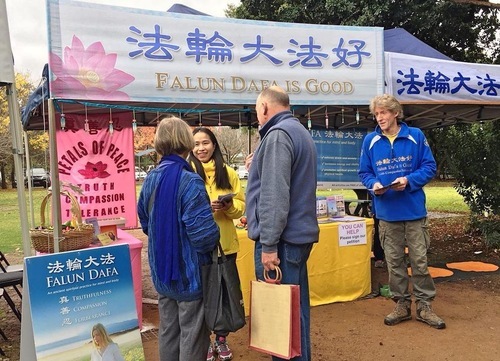 Falun Gong practitioners in Melbourne, Australia participated in community events in two nearby towns, Violet Town and Rutherglen, on June 9 and June 10, 2018. They introduced Falun Gong, a traditional Chinese cultivation practice, and exposed the communist regime’s persecution of the practice in China. The monthly market in Violet Town is the oldest and largest market in Victoria. Despite the wet ground after a heavy rain, many people in the area went to the market for shopping and great food. Many were fascinated by the calming exercises of Falun Gong. A woman said that this practice was exactly what she needed. She was so thankful that practitioners came from Melbourne to bring the information of Falun Gong. Some other residents said they wanted to introduce it to their families and friends, and invited practitioners to return and hold exercise teaching sessions. Local residents sign a petition calling for an end to the persecution by the Chinese Communist Party. Practitioners participated in a country fair in Rutherglen, a town in north-eastern Victoria, on Sunday, June 10. More than 300 businesses and groups brought many visitors from both Victoria and New South Wales. Falun Gong practitioners’ booth attracted a lot of attention. Some people spent a long time talking with practitioners while their children learned how to fold paper lotus flowers. Many signed the petition calling for an end to the persecution. 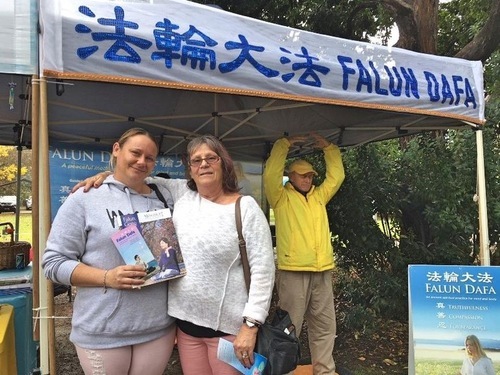 Ms. Tanaya Evelyn from Euroa, together with her mother, children, and friends, spent a long time at the Falun Gong booth. She said, “It’s the first time I have seen the Falun Gong exercises. A friend of mine has recommended this to me. I’m so happy to find you here. This is what I really need!” She was happy to get the information and hoped to go to Melbourne to learn the exercises. Tanaya Evelyn (left) and her mother. 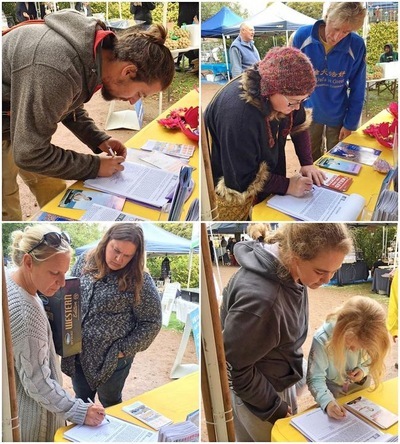 Ms. Annie Mitchell, who works at a local coffee shop, signed the petition and wanted to learn Falun Gong exercises. She took a stack of flyers to share with her family, friends, and customers. She wanted to gather a large enough group of people interested in learning so that practitioners could come back to hold an exercise teaching session.